Our clients range from leading multinational companies to new and growing enterprises, from large family businesses to private individuals. 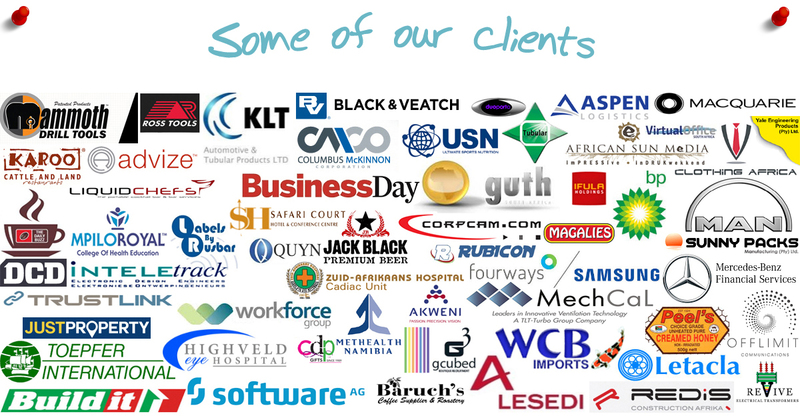 And they're located nationally and globally extending well beyond South Africa to clients in Namibia, United States of America, France, Germany and Australia. We are proud to say that many of our clients have been recommending us to their peers for over 20 years. Cape Fruit Processors (Pty) Ltd. Specializes on the processing of fruit concentrates, blends and segments. Process Plant Technology (Pty) Ltd. Supply engineered systems and plants into the chemical, pulp and paper, mining, minerals and food and beverage industries. "...Strive not to be a success, but rather to be of value..."
If you have an interest in finding out more about how we may be able to serve you or your client, please contact us. We would be happy to discuss your needs and how our team can be of service. Feel free to call or email us. We regularly check emails and the email link above will be immediately routed to a member of our staff who will promptly respond to you. If you send us an email we typically reply to you within an hour - please check your Junk or Spam e-mail folder just in case our email was delivered there instead of your inbox!